CLEVELAND, OH — August 2018 — Sly, Inc., (www.slyinc.com), a 144 year old manufacturer of dust collectors and other air pollution equipment, is pleased to announce the opening of a new sales representative firm in Golden, Colorado. Techna-Flo Engineering and Associates, Inc. is now proudly representing Sly in Colorado, Montana, Wyoming and New Mexico as well as sections of Wyoming, South Dakota, and Nebraska. 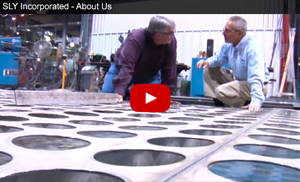 Techna-Flo Engineering is a three-person representative company located in the Denver area. Owner Key Irwin, P.E., has worked in the industry since the early eighties and has a significant knowledge in bulk material handling and packaging. 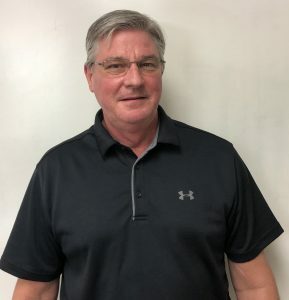 CLEVELAND, OH — July 2018 — Sly, Inc., (www.slyinc.com), a 144 year old manufacturer of dust collectors and other air pollution equipment, is pleased to announce Ed Reid has joined Sly, Inc. as the plant manager of their Mathiston Mississippi plant. Ed has a Bachelor of Science in industrial technology from Mississippi State University and ten years of plant management experience. Ed’s former roles include general manager and operations manager at Plymouth Tube Company, technical director at North America and Albea Group, and business unit manager for ARC Automotive. In addition, Ed earned a Six Sigma Black Belt from Sequa and Lean Manufacturing training from the University of Tennessee. 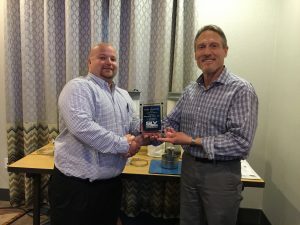 CLEVELAND, OH — May 2018 — Sly, Inc., (www.slyinc.com), a 144 year old manufacturer of dust collectors and other air pollution equipment congratulates Carolina/Virginia representative office Whitlock Industrial Equipment for achieving the number one sales territory of 2017. 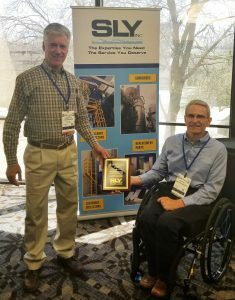 Sly’s Wet Scrubber Product Manager Dwayne Sanders presented Whitlock Industrial Equipment owner Tom Harkness the award last month at the 2018 Powder Show in Chicago IL. Sly also thanks all of their sales representatives for their hard work in 2017, and wishes continuing success in 2017. CLEVELAND, OH — May 2017 — Sly, Inc., (www.slyinc.com), a 143 year old manufacturer of dust collectors and other air pollution equipment congratulates Oklahoma representative office Osborn Equipment Sales for achieving the number one sales territory of 2016. Sales Engineer Dave Mosinski presented Osborn Equipment representative Derrick Diffee the award last month at the Sly Rep Training and Meeting in Columbus, MS.
Sly also thanks all of their sales representatives for their hard work in 2016, and wishes continuing success in 2017.